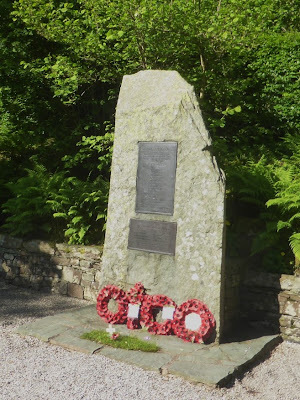 Towards the end of the First World War the inhabitants of the Parish of Patterdale collected money in order to establish a permanent Monument as a Memorial to the Officers and Men who fell in the Great War. In February 1921, William Hibbert Marshall, owner of Patterdale Hall, donated a piece of land (adjacent to the A592 near St Patrick's Well) to allow for the building of a permanent Monument. The memorial slab was hewn from a twenty ton piece of local slate, even the finished slate stone still weighs in at around 5 tons. It was donated and carved by quarry owner Arthur Pattinson of Glenridding and was carved on site. There is a large open space around the memorial, approached by steps from the road, and on the fellside above the wire fence it is intended to plant suitable flowers. Saturday was an ideal day for the ceremony. The first part of the proceedings took place at the church...The service was conducted by the Rev W P Morris, C.F., Senior Chaplain to the 43rd Division (East Lancashire), and Mr M Place*, as representing the Wesleyans of the dale read the Lesson…Colonel Weston stepped forward, withdrew the Union Jack, and saluted the memorial. The Rector dedicated it and read the inscription, and Colonel Weston afterwards addressed the large company. He said – War was always a terrible thing, and he prayed and hoped that never in their time would there be another, but even amid the horrors of war there was a bright side, and that was the magnificent heroism and sacrifice that their gallant young fellows made…Corporal Wannop, Border Regiment, went on to the hillside above the memorial and sounded the Last Post and the Reveille. In this photograph of the memorial, which was taken in the 1920's, the steps can be seen which led up from the road. Each year during the Remembrance Day service, the road would be closed so that the large number of mourners could stand below the memorial and watch as wreaths were taken up the steps in turn. The new path, built a few years ago, has provided a larger and more level area closer to the memorial. Many of us have walked past the War Memorial and seen the names inscribed on the plaques but who were these men and what is their connection with the Parish? To mark the centenary of the first World War, Rob Shephard and Norman Jackson have dug into the archives, old newspapers, war diaries and service records, to try and put faces, families and stories to the names. Click on a person's name to read more about them. Note 1: The name of Oliver Readshaw does not appear on the actual memorial. He has been included on this 'virtual' memorial because he was born in Glenridding and attended Patterdale School and meets any criteria that could have been applied when placing his brother George's name on the list. He appears on the Roll of Honour but without the Crucifix next to his name, which suggests that the Memorial Committee did not know that he was killed just a month after George. Like many of the mining families, the Readshaw's had moved away to the North-East to work in the Coal Mines. So, unless a relative or a friend was still in contact with someone in Patterdale and knew about Oliver's death, there is no way that the Memorial Committee would have known. Also, the fact that George Readshaw's name is at the bottom of the list and out of the alphabetic sequence, suggests that news of his death didn't arrive in Patterdale until after the plaque had been made during 1921. 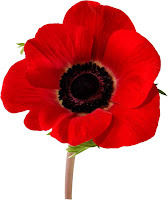 Words from Laurence Binyon's poem “For the Fallen”.